The water-resistant/breathable Twilight replaces Black Diamond's Winter Bivy as the lightest bivy sack in the Black Diamond collection. Aside from its bright green coloring, the principle change is a switch to 'NanoShield' fabric from Epic, and the addition of a mesh over-the-face panel for bug protection. What is NanoShield? I believe it is basically a re-branded Epic, with the primary difference being manufacturing improvements designed to deliver more consistent results. In other words, maybe inconsistent milling led to Epic's spotty reputation (some people thought it was fantastic; some thought it was unreliable). NanoShield brings better quality control to (hopefully!) better deliver on Epic's promise of lightweight, waterproof/breathable performance, plus a new name to make a clean break with Epic's checkered past. And maybe there are some actual design/materials changes as well—I'm not sure. In any case, Black Diamond is indicating a lot more confidence in NanoShield than Epic by getting rid of the 'winter' designation in the successor Twilight, and rating this as a true four-season bivy, the number four presumably including summer and/or rainy days. 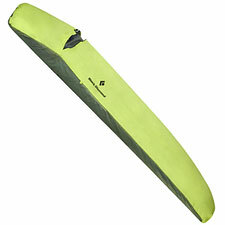 Who and what is the Twilight Bivy designed for? First of all, these can be used as minimalist shelters for the absolute lowest-of-the-low ounce-counters. I tend to think of a bivy as insurance in these situations, rather than as tent or mid replacements—getting caught in a true sustained downpour in a bivy sack is not my idea of fun, even if (miraculously) nothing leaks. So if skies appear threatening in the parking lot, maybe you should think twice about your shelter choice. On the other hand, where pounding rain is not likely to be a threat, an Epic or NanoShield bivy looks like a very reasonable way to reduce your overnight load. I especially like these for overnight spring ski touring in the Sierra, when thunderstorm odds are nearly nil, and temperatures and weather are generally mild. Your bivy can double as a ground cloth, saving more weight, and protecting your sleeping bag and sleeping pad (a standard-sized thermarest pad will fit inside). In more challenging conditions, adding a bivy inside your tent adds protection from water, mud, and snow, plus a bit of extra warmth. As for the mesh panel option, I'm not sure it makes sense in this particular design. The fabric plus the extra zipper is costing us at least an ounce, and mesh sitting directly on your face doesn't seem like the best form of bug protection—though it is likely better than nothing. In my experience, the breathability of Epic/NanoShield fabric clearly outperforms Gore-Tex laminates, and this translates directly into better sleep comfort, making it an excellent choice for bivy sack shells. Based on the fabric's reputation and the Twilight's construction, I'll rate this good to go for the occasional sprinkle or even short-lived shower, but far from ideal in heavy rain. That is all.